Marc Warren admits he "left a few" on the course as he carded an opening-round 72 at the US PGA Championship, but is happy at level par. Leading Scot Warren, six shots off leader Dustin Johnson, was two under at the turn but Whistling Straits' windy conditions made club selection tricky. Stephen Gallacher shot a four-over 76, the same as Martin Laird. Ex-pat Scot Steven Young ended the first round on five over, one ahead of Colin Montgomerie. 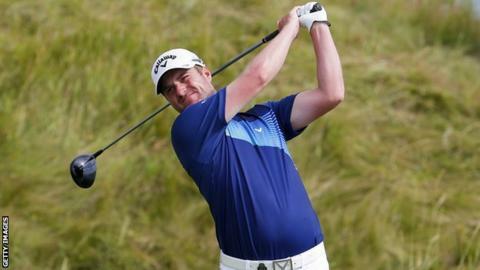 Russell Knox matched Young's round of 77 while Richie Ramsay is nine over. "I did get off to a good start, obviously frittered it away a little bit," said Warren. "Level par in a major first round's never too bad. "It was a really good start, the wind picking up on probably the tougher nine of the two, the front nine. "I felt as if a I threw a couple of shots away, to be honest. Iron play was pretty poor most of the day. "I'll take the positives. I drove it well, putted really well too. Keep those two things going and get the iron play half decent, I think we should be okay."